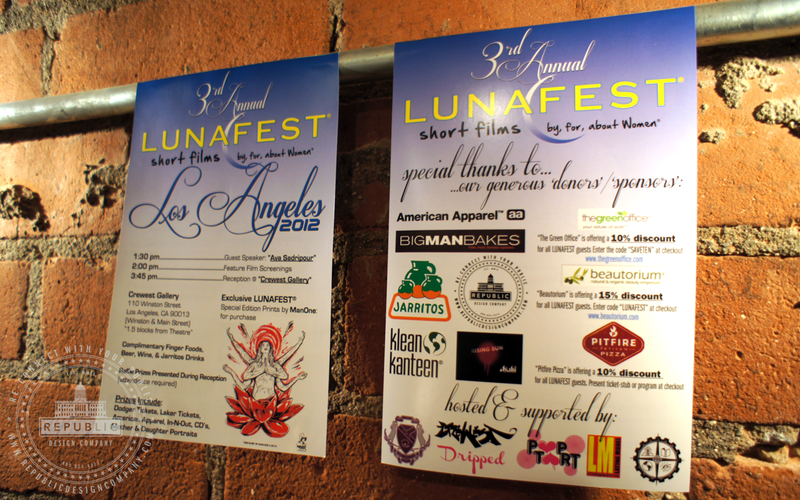 Republic Design Company is a proud sponsor of the 3rd Annual LUNAFEST® Los Angeles 2012 charity/fundraiser. 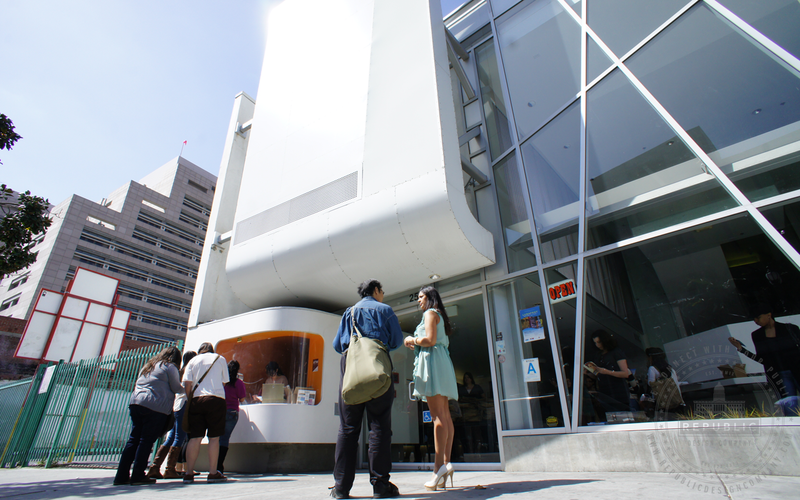 On Sunday, March 11th, 2012 from 1:00pm until 5:00pm, Republic Design Company enjoyed a beautiful afternoon in Downtown LA at the Downtown Independent to raise funds for the Breast Cancer Fund & St. Jude Children’s Research Hospital at the annual LUNAFEST® Charity Event. Established in 2000 by LUNA, the makers of the Whole Nutrition Bar for Women, LUNAFEST® connects women, their stories and their causes through film. This traveling film festival spotlights the work of a diverse array of talented women filmmakers with intelligent, funny and thought-provoking themes. 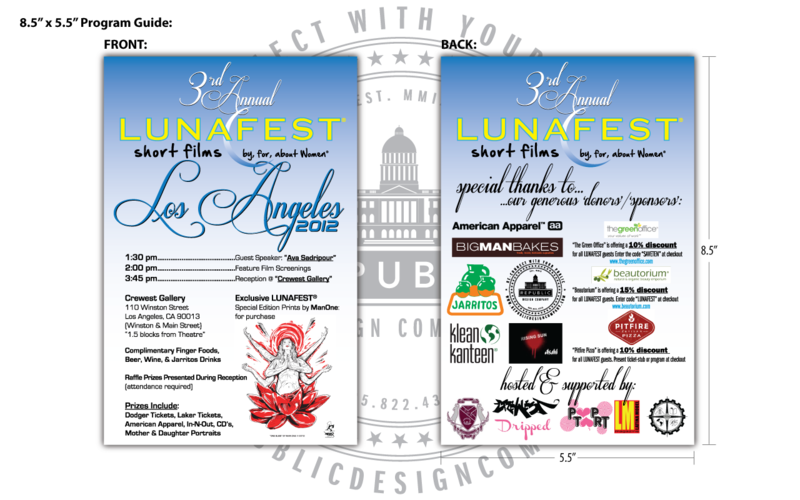 LUNAFEST® is a traveling short film festival by, for, about women that will visit over 150 cities throughout the 2011/2012 season(October – June) and screen in front of 20,000 people. Their featured 2011/2012 films include stories of reflection, hope and humor from around the world.More information on their films and filmmakers is available on their LUNAFEST® Film Page. 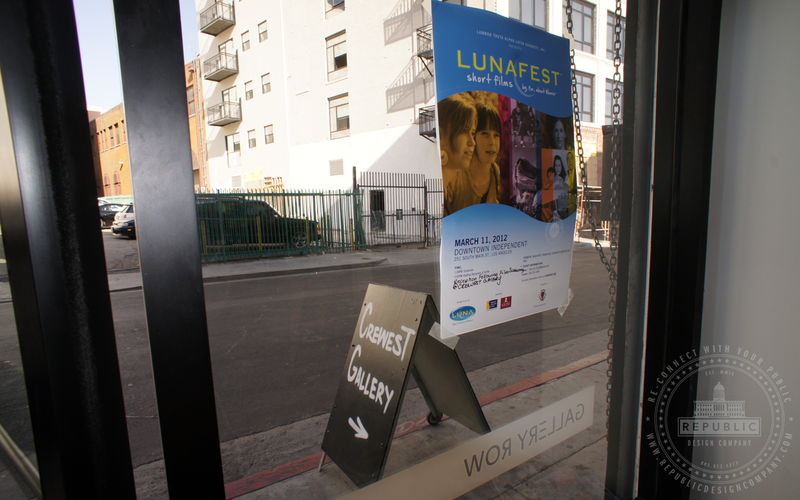 http://www.lunafest.org/the-films. Reception following the film screening was held at the Crewest Gallery located a block and a half from the Downtown Independent at 110 Winston Street Los Angeles, CA 90013. Raffle was held during the Reception. 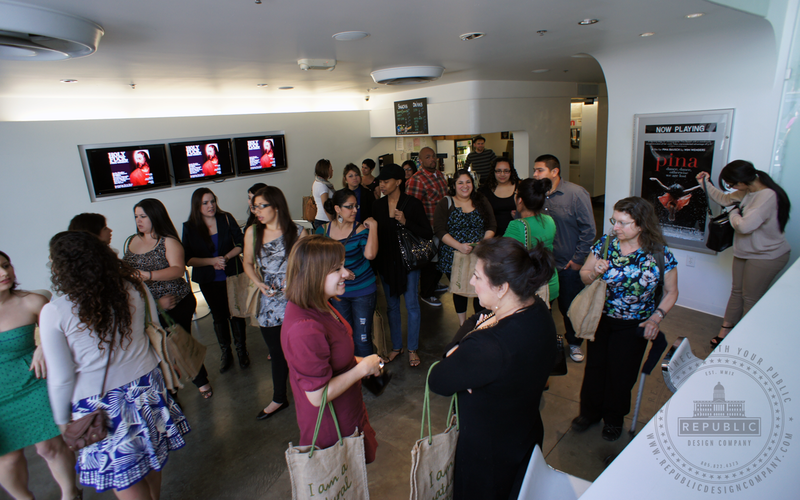 Lots of goodies were given away!!! In recognition of Women’s History Month and to rejoice LUNAFEST® whose mission is to celebrate and inspire women through the art of film and community fundraising, Man One is proud to release his newest print “One Bliss” with proceeds to benefit the Breast Cancer Fund and St. Jude Children’s Research Hospital. “One Bliss” was created by Man One to show the empowerment of women and her energy, aura and movement. 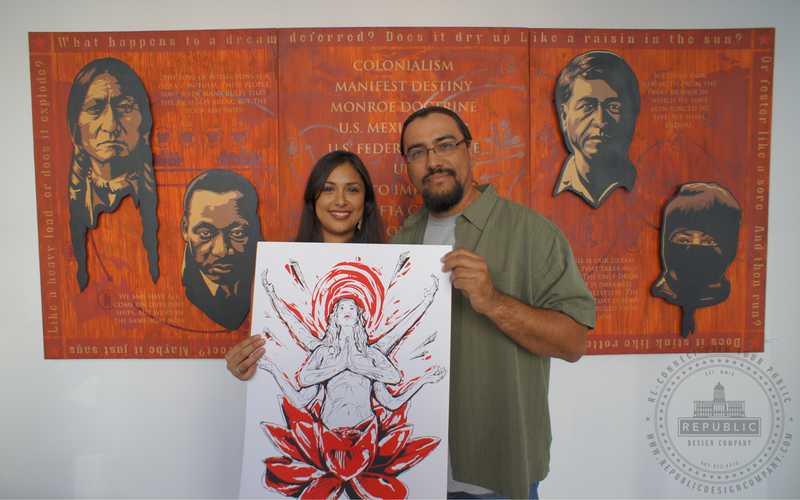 The image in the print shows a woman of strength stemming from a red lotus. “The red lotus signifies the original nature and purity of the heart . It is the lotus of love, compassion, passion and all other qualities of the heart. It is the flower of Avalokiteshvara, the bodhisattva of compassion.”- buddhanet.net. One Bliss is 18 x 24, printed by Two Rabbits Studios and is $40. 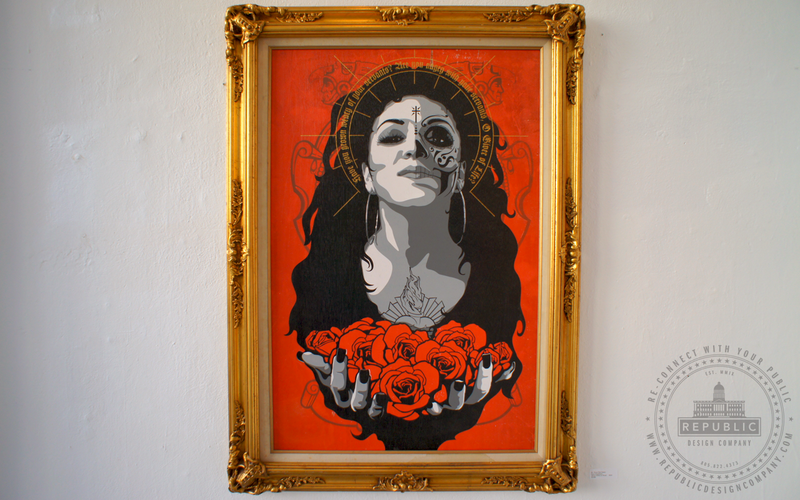 You can purchase this print online at Crewest.com or at the gallery. Due to the print’s overwhelming popularity, rumor has it, a possible t-shirt is in the works.